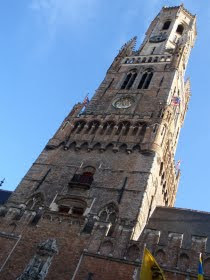 Thirsty Pilgrim: Bruges, Beers, Belfries and Books. Only in its third year, the Bruges Beer Festival has become one of the country's most popular among enlightened drinkers. The main reason is Bruges itself. The prolific beer list doesn't hurt, with 277 different beers from 67 breweries and beer firms. * And it's hard to beat the location in the base of the Belfort tower. This is all to remind you that it's going on this weekend, if you don't have other plans yet. It runs from noon to 10 p.m. Saturday and 11 a.m. to to 9 p.m. Sunday. The horseshoe-shaped room got pretty crowded in the afternoon last year, so consider arriving early to claim your personal space. I should mention that Tim Webb and associates Cogan & Mater will have a presence in the festival's bookshop. (FYI, Cogan is the tall one in the dark suit, while Mater carries the metal briefcase chained to his wrist.) 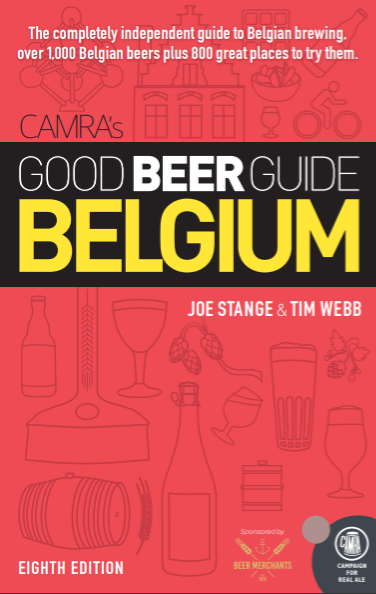 Tim will be signing the indispensable** latest edition Good Beer Guide Belgium, while Podge and Siobhan will be signing Around Bruges and the hugely underrated Around London. And at 3 p.m. Sunday Yvan and I will be signing Around Brussels. Stop and say hello, especially if the bookshop is far removed from the beer stalls, in which case we may get mighty lonely. *"Beer firms" is the term for all those who either brew in other people's breweries or hire others to do it for them, and the designation says absolutely nothing about quality. It only means that they are not technically breweries. **It's plainly true and sadly I don't get paid extra for saying so. Such good terminology, Joe. I like beer firm as well as enlightened drinker. I also like "indispensible" as it is simply true. Well that sounds like something to think about for next year. For this year Brussels will do next month. No festival, just a lot of bars to visit and a lot of beer to drink. Have a good weekend old son! So bad I had to leave Belgium on saturday. Sooo bad.